BoardeX is an excellent glass-mat gypsum sheathing product specifically designed to be moisture resistant and fire resistant. It has a moisture resistant reinforced gypsum core and special orange fiberglass exterior mats instead of similar paper faced products. The panels feature a moisture and mold resistant gypsum core encased in a glass-mat facer on both sides and achieve a 10 rating on the ASTM test for mold resistance. BoardeX is used as backerboard beneath all kinds of claddings (including metal sidings, vinly siding, wood sidings and decorative brick sidings). BoardeX is used for all kind of soffit applications. BoardeX is indispensable for interior wet areas. 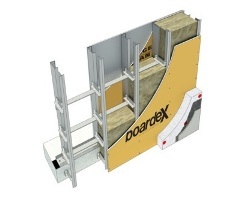 The nice thing about BoardeX is you can cut it with a utility knife just like using regular plasterboard. 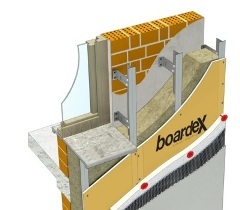 BoardeX is the first exterior sheating board that used in external walls with fiber glass mat launched in Europe and Turkey after United States. Fiberglass mats penetrate into the panel to make an integrated unit that offers superb strength; outstanding resistance to delamination, deterioration, warping and job site damage; and an excellent bonding surface for EIFS. 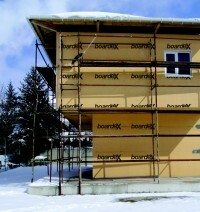 The flexural strength of BoardeX Exterior Sheathing is approximately the same in both directions. This means BoardeX Exterior Sheathing can be installed either vertically or horizontally without sacrificing wall strength between studs. 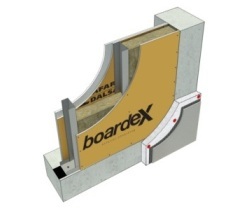 BoardeX Exterior Sheathing panels also protect and help stabilize structural framing. 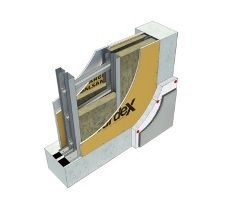 BoardeX CT, used in CEKETLEME and CeketMAX systems, is a 275 g/m2 galvanized facade profile with a 0.9 mm thickness to which BoardeX can be fixed. BoardeX L bracket part of the CEKETLEME, Ceket Omega and CeketMAX systems, is an L bracket 2 mm thick made of special, low heat transmission coefficient steel. 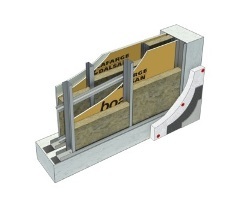 This item allows for the adjustment of a façade’s vertical alignment, permitting the use of thicker insulation materials. The L bracket 150 has a thickness of 3 mm. BoardeX Exterior Sheathing is resistant to normal weather conditions, but it is not intended for immersion in water. Cascading roof/floor water should be directed away from the sheathing until appropriate drainage is installed. 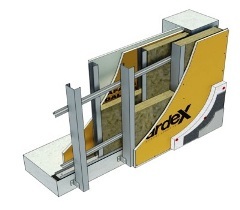 When BoardeX Exterior Sheathing panels are used in slanted wall applications, that portion of the wall must be temporarily protected from the elements by the use of a water-resistant barrier prior to application of the cladding. Do not allow water to pond or settle on sheathing. Also, exposed wall ends such as those that may be found in parapets must be covered to prevent water from infiltrating the cavity. BoardeX Exterior Sheathing is not intended for roof applications. Anti alcali joint tape should be applied to BoardeX’s joints with Probase (Cement based jointing compound and basecoat). Anti alkali plaster mesh with 160 gr/m2 weight applied to BoardeX should be burried into the plaster and be close to outer surface. Insulation material (EPS/XPS) to be applied on BoardeX surface should be fixed to metal studs using self-drilling fixing dowels. In order to keep corners straight, PVC based corner mesh profiles should be used.